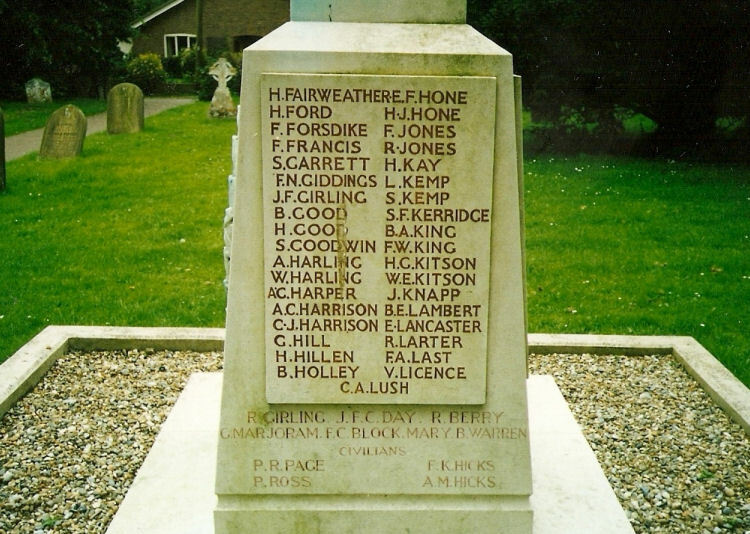 This site came about following a discovery in a Suffolk, England, church yard (left) that a relative of mine, Frank Forsdike (my great-grandfather's brother), had lost his life in the First World War. This discovery, back in 1995, affected me deeply, more so when I found out that this loss was with a Central Ontario regiment, the 4th Canadian Mounted Rifles. Canada was a long way from the rural English town of Leiston that Frank had grown up in, as was that infamous Ypres Salient field in Belgium that was his last stand, in June 1916. I quickly learned that Frank had married a young lady called Myrtle Cole and that the couple had a daughter, Florence, who was just 2 years old when Frank was killed on the opening morning of the Battle for Mount Sorrel, on June 2nd, 1916. However, when I looked further into Frank's life, I was saddened to discover his medals were still in the vaults in Ottawa, unclaimed because neither his wife and daughter, in Toronto, nor his mother, back in England, could be traced in 1920. Although I searched for any clues that Frank's family had perpetuated through Myrtle and Florence, none were to be found. After many false leads and dead ends I had essentially given up on the search by early 2006. However, the quest had put me in contact with a good many people whose relatives had served in the regiment, so I decided to create a website that would be a point of mutual contact for those people; the focus being on ensuring, in a dignified and respectful way, that the men of the 4th CMR were not forgotten. Also, I realised, it would be there should the family of Frank Forsdike ever go looking for details on their relative. The site went live in May 2006, and slowly and surely the contacts came in and the In Memoriam page began to expand. On November 11th, 2007, most poignantly, I was sifting through 4th CMR contact emails when my eye caught one in particular. I read it in increasing amazement, as this was in fact the email that I had been waiting for! Bert Layton was asking if I was a cousin because his grandfather was one Frank Forsdike, Corporal of the 4th CMR! In a spare moment between teaching sessions, Bert had stumbled across this website whilst he looked for sources that might lead to an understanding of his grandfather's little understood history. 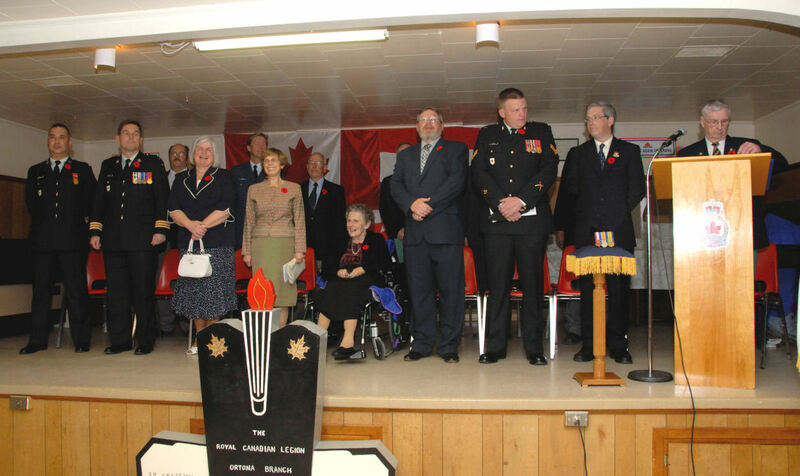 Not only did 4cmr.com have details about the regiment his grandfather had served with, amazingly it also had a page dedicated to his grandfather, which included images he and the family themselves, long since moved to Nova Scotia, did not have. What a day that was! Please do take a look at Frank Forsdike's page to read Frank's biography and to see what happened next, especially concerning the subsequent and long overdue memorial ceremony, on May 10th, 2008. Covered coast to coast in Canada, Frank's medals finally came home in an emotional presentation (right) to his daughter, Florence, aged 95. 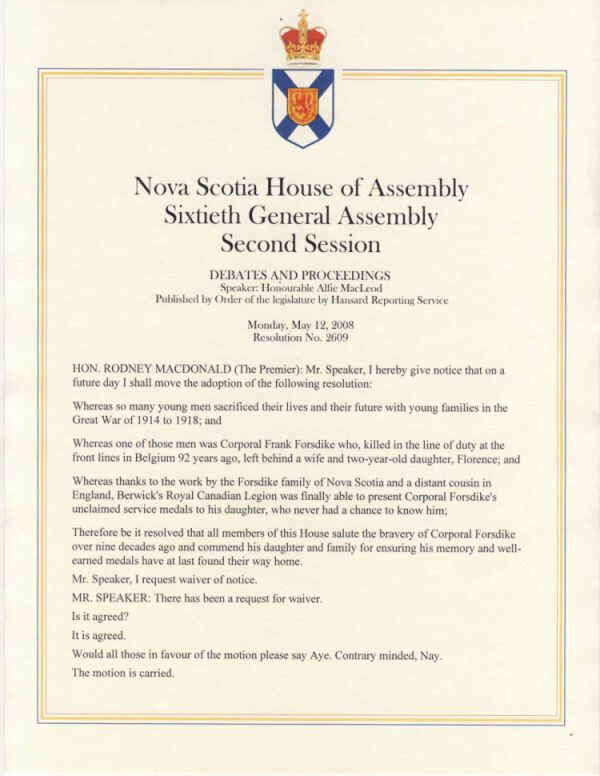 There was further validation of the work that was started here, concerning Frank's life, service and sacrifice, when, as a direct result of the medals ceremony that weekend, Frank's name was honoured under Resolution 2609, in the Nova Scotia House of Assembly a few days later. This website was instrumental in Frank's grandchildren, Bert, Margie and Helen, finding out about their grandfather, and more so for Florence to learn about the father she never knew (she was 2 years old when he was killed in 1916). 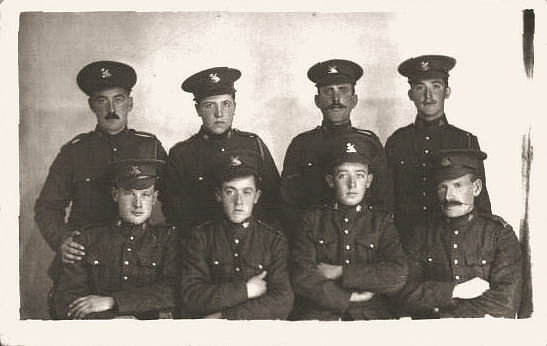 Indeed, the site continues to help people find out about relatives who served in the 4th CMR, as in one of those odd coincidences, a photograph (left) I had of Frank as a Corporal (back row, 3rd from left), with 7 men of his Section, was buzzed "down the line" to aid a young lady in Ontario to see what the 4th CMR uniform looked like, only for her to discover her grandfather, Pte. Francis Kidd (front row, 1st left) was in the picture!! It is a small world sometimes. The legacy of this site is that as contacts are made, names are added to the "Wall" on the In Memoriam page and branches of families, long gone their own ways, are brought back together again. It is heart-warming every time it happens. Whilst some people find each other in the process of researching a common relation, yet others discover important details about their own roots, about who and where they themselves came from, as indeed did I when I started out on this voyage of discovery back in 1995.